Child Safety is very important nowadays and everyone wants to get SMS alerts from the school about their child attendance in the school. Traditional ways of sending SMS is very time-consuming. It takes so many hours in collecting data and informing the parent about the child attends. We have a new solution for this in which we automate the attendance. In this system, our Biometric time and attendance machines are used to capture the attendance of the child. This can be done using the RFID cards, the fingerprint of the child, face recognition technology. This information is transmitted to the server automatically and from where the SMS is pushed to the parent mobile using the SMS Gateway. We use the world-class gateway for sending SMS. The complete attendance is collected and sent to parent mobile. School gets an option to send customized SMS with the name of the child to prevent the confusion in case of multiple children of a parent. Even absent SMS can be sent after a particular time intimating parent. This complete process of sending Attendance SMS is automatic. There is no manual process required. 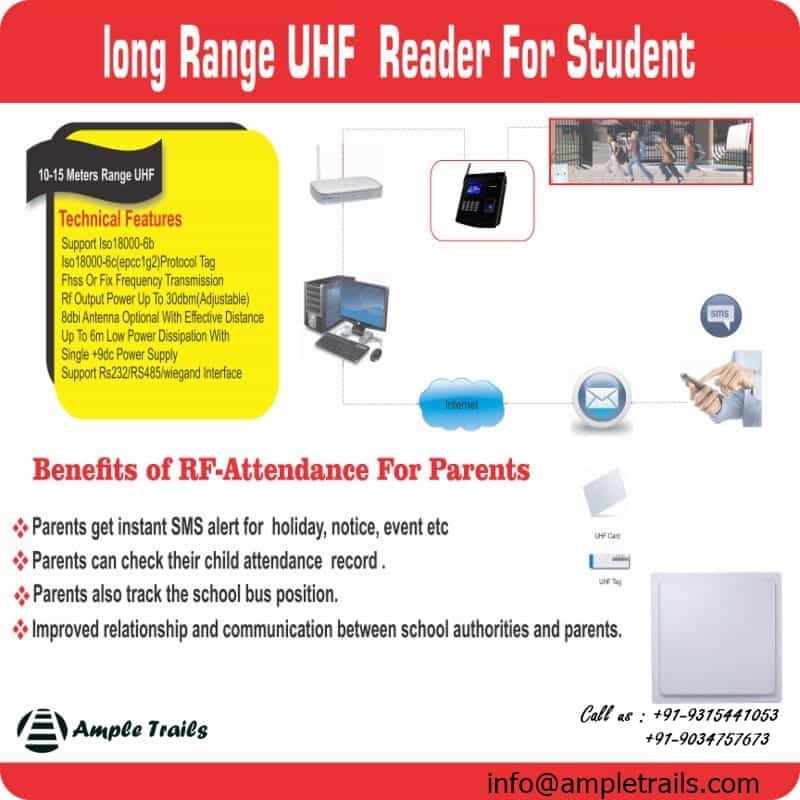 UHF attendance system for school is a long-range RFID based attendance system. UHF readers are capable to capture students at a distance up to few meters. UHF attendance system is very fast. In UHF attendance system for students, students need not wait at the gate. UHF Antennas are wall mounted. Student’s ID-Card can be embedded with a UHF card. When the student passes through the gate, wall mounted UHF antennas track individual identity using ID card. 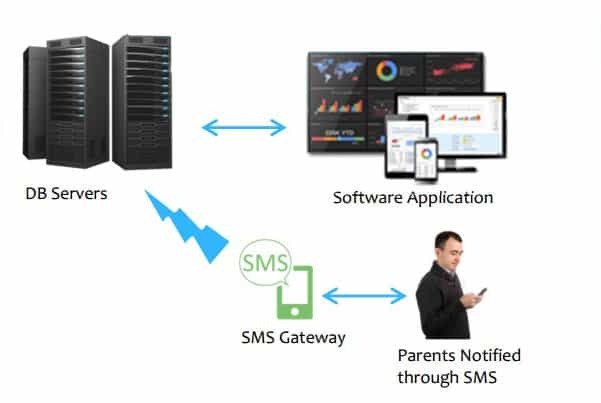 The server which is present in the school or hosted on the cloud sends instant SMS to parents’ mobile numbers. Different kinds of attendance reports can be generated. Complete UHF based student attendance system is GPRS based, plug and play. To get this wonderful School Attendance Management Solutions with SMS Alert solution implemented in your organization get in touch with us. Mail us at info@ampletrails.com or call us at 9818390836, 09315441078 WhatsApp 9315441053 or fill the following form. One of our experts will contact us immediately. Our GPRS based Wireless RFID Attendance for Schools is as easy as Plug and Play. We have lots of happy schools which have automated their attendance process using our system and is sending SMS to parent mobile. We have machines to take the attendance and send SMS using the Bulk SMS API. This is a completely automated system of sending SMS to parents mobile number. Parents get instant alerts about the attendance of their wards. This is used by the institutes especially for the girl child where the safety and information are very important. We automate the Student Attendance Management process of sending SMS. SMS can be sent to various events. You can use any of our TCP/IP based attendance machine for punching of data. Not only this you will also be able to see the SMS logs and delivery report. Biometric Face Recognition based Automated Student Attendance Management. Fingerprint Automatic attendance Solution for students attendance. RFID based time attendance machines for automatic student attendance with SMS Gateway integrated. Can automation manage system alerts?